Gov. Doug Ducey won't debate his Republican foe, with an aide calling Ken Bennett a "fringe'' candidate despite the fact he was elected secretary of state in 2010. Gubernatorial hopeful Ken Bennett is using the question of who would replace John McCain if and when the senator quits or dies to round up votes and raise money for his gubernatorial campaign. Lawmakers hope to take another look at the governor’s proposed school safety plan before the legislation is debated in committee. Gov. 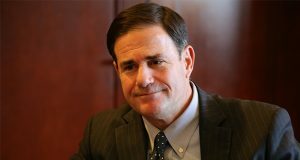 Doug Ducey is vulnerable to a Democratic challenger in the 2018 election as voters find him lukewarm, a new poll shows.